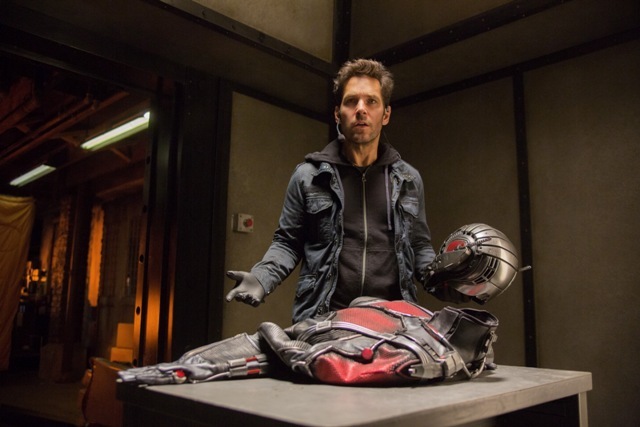 Ant-Man isn’t exactly a well-known character and Paul Rudd doesn’t exactly conjure the superhero archetype. Combining those contrasting elements, can Marvel Studios pull off the unthinkable and create another hit movie? Quite possibly the riskiest movie of the summer, Ant-Man hopes to expand the Marvel Cinematic Universe with a superhero who has a weird name, along with weird powers, by overcoming his shady background in order to become the ultimate role model! Paul Rudd’s Scott Lang is an ex-convict who’s just been released from prison. Attempting to turn the corner in his life, he can’t afford to go back to jail. He’s already missed too much time away from his daughter. After being released from a menial job, he accepts one last heist with hesitation. After discovering the mission is a bust, he steals (then attempts to return) his big score: a weird “motorcycle suit.” Little does he know he’s just been recruited to become the Ant-Man! Michael Douglas portrays Dr. Hank Pym, the aging scientist who discovers the Pym Particle, allowing himself to shrink in scale but increase in strength. He’s the head of this operation. Corey Stoll is Pym’s protege, who has turned to the dark side (later becoming Yellowjacket). And Abby Ryder Fortson is Scott’s daughter, Cassie, who becomes the foundation for this entire adventure. Together, Pym and Lang hope to prevent Hydra from getting their hands on this incredible, shrinking technology. As a movie, Ant-Man is much riskier than Guardians of the Galaxy (the previous would-be Marvel flop). While Guardians also featured a group of lesser-known characters; ultimately, it was a space opera, and proved successful. This is a heist-with-a-heart flick, that ultimately leads to redemption. They’re two totally different movies, but will they both lead to the same box-office pot of gold? With the release of this movie, Phase 3 has officially begun for the Marvel Cinematic Universe and the biggest contribution of this movie is the introduction the Quantum Zone, which will be explored in future movies. Another big-name actor makes his presence felt within the MCU. Robert Redford was the first, in Captain America: The Winter Soldier and now Michael Douglas chews his screen-time with glee in Ant-Man. Randomly wondering who will be the next one? Evangeline Lily shines as Hope van Dyne, with her supporting role graduating into a larger presence for future Marvel movies. There’s some ridiculous secondary characters scattered about the film, who I didn’t really care for, but they did offer decent comic relief, at times. I understand the MCU, for the most part, follows along the Ultimate storyline of each of its comics, but the MCU really missed the mark by not basing this movie on Hank Pym — one of the smartest characters in the Marvel Universe — as Ant-Man. It’s a lost opportunity. While we’ve been hoping for a long time that Season 2 of Agent Carter will feature a season-long flashback adventure paired with Dr. Hank Pym, now that he’s been introduced to the Marvel Universe, maybe that can happen. Make sure to carefully watch the ’80s flashback at the beginning of the movie. An aged Peggy Carter (along with Howard Stark) shine in their cameos. Pairing those characters, along with Pym, would definitely be an adventure worth the price of admission. Hopefully Pym isn’t killed off prematurely before he can make a cinematic impact (especially after Michael Douglas recently had major health concerns). Many people have already written off this movie, expecting a letdown. Clocking in with a $130 million budget, this will be the surprise hit movie of the summer. I was impressed with the outcome. While he doesn’t have any superpowers to speak of, Ant-Man has great technology that makes his character more similar to Iron Man than The Incredible Hulk. Here’s to hoping more of the good aspects from the character’s rich comic-book background get revealed in future movies (or TV series), hopefully leading to a box-office haul closer to Tony Stark’s individual adventures, than that of Ang Lee’s Hulk. After watching Ant-Man, you may think twice about swatting insects. You never know if a superhero might be tagging along for a ride. Strength: Great acting performances and a great twist on the superhero genre. Weakness: Whenever a good guy creates new technology, there’s also an evil version. WTF Moment: Scott battles a current member of the Avengers… laying the groundwork to become a possible recruit?